University of Delaware received a A.
U.S. News & World Report's ranking of 30 out of 117 of National Universities Top Public Rankings was a major contributor to this grade. "In-staters and students from all over the Northeast converge on the University of Delaware, a "very-student oriented" college with easily accessible professors. Lively Main Street runs literally through "absolutely the most gorgeous campus anywhere." Describe the type of student who should not attend University of Delaware and explain why. Describe the type of student who should attend University of Delaware. Why? What is a typical University of Delaware student like? Describe the type of person that should attend University of Delaware. A typical University of Delaware student is open and accepting of all types of people, friendly, approachable, and hardworking. What are the top 3 reasons someone should attend University of Delaware? What was a typical University of Delaware student like in high school? Describe the type of person that should attend University of Delaware. A student fit for the University of Delaware should be hard working, focused on their school work and social. This student should be eager to interact with their peers and work together to learn effectively and efficiently. A public gem that boasts of more than 125 solid academic programs, from engineering to education. Provides the proverbial balance of work and play...abounding extracurricular options and a welcoming involved student body. It's rare that a flagship state university enrolls more students from out of state than in state, but the University of Delaware does. A competitive school for out-of-state students with an ever-growing academic reputation. The University of Delaware has a great tradition of excellence, from our founding as a small private academy in 1743, to the research-intensive, technologically advanced institution of today. Our alumni tell our story of achievement, from our first class, which included three signers of the Declaration of Independence and one signer of the U.S. Constitution, to the more than 145,000 living Blue Hens who are making vital contributions to the world. Vice President Joseph R. Biden Jr. and his wife, Jill, are both UD alumni. The University received its charter from the State of Delaware in 1833 and was designated one of the nation's historic Land Grant colleges in 1867. Today, UD is a Land Grant, Sea Grant and Space Grant institution. The Carnegie Foundation for the Advancement of Teaching classifies UD as a research university with very high research activity--a designation accorded less than 3 percent of U.S. colleges and universities. UD ranks among the nation's top 100 universities in federal R&D support for science and engineering. A state-assisted, privately governed institution, UD offers a broad range of degree programs: 4 associate programs, 137 bachelor's programs, 117 master's programs, 50 doctoral programs and 12 dual graduate programs through our seven colleges and in collaboration with more than 60 research centers. Our student body encompasses nearly 17,000 undergraduates, 3,700 graduate students and 850 students in professional and continuing studies from across the country and around the globe. Our distinguished faculty includes internationally known authors, scientists and artists, among them Nobel laureates, Guggenheim and Fulbright fellows, and members of the National Academy of Engineering, National Academy of Sciences and the American Association for the Advancement of Science. 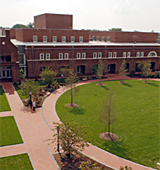 State-of-the-art facilities support UD academic and public service activities. Our 146-foot coastal research vessel, Hugh R. Sharp, the most advanced in the U.S., helps scientists across the region explore the sea. World-class figure skaters train at our High Performance Figure Skating Center. Partnerships with Nemours/A. I. du Pont Hospital for Children, Christiana Care and Thomas Jefferson University; the U.S. Army; Winterthur; Longwood Gardens and Hagley Museum offer unparalleled experiences in health sciences, defense research, art conservation, horticulture and history. The University is now transforming a 272-acre parcel, the site of a former auto assembly plant, into a science and technology campus. Distinguished speaker series, symposia, 21 intercollegiate athletics programs and numerous intramural and club sports, more than 300 student organizations, concerts, exhibits, and other arts and cultural activities enrich campus life. Thomas Jefferson once described Delaware as a "jewel" among states due to its strategic location on the East Coast, halfway between Washington, D.C., and New York City. Today, however, the location of Delaware's flagship university increasingly is invoked as "halfway between Los Angeles and London." In addition to our Georgian-inspired main campus in Newark, Del., UD has locations across the state--in Wilmington, Dover, Georgetown and Lewes. A thriving study-abroad program and expanding international partnerships further enhance our students' education as global citizens. We invite you to visit our campus or take our virtual tour today! What are the top 3 things that students do for fun at University of Delaware? 14% of students received Pell Grants, which are provided by the U.S. government to students from middle and lower income families. It gives you an idea of a school’s socio-economic diversity. 44% of students live on-campus. 16% of male students live in fraternities. A program that focuses on the study of the mind and the nature of intelligence from the interdisciplinary perspectives of computer science, philosophy, mathematics, psychology, neuroscience, and other disciplines. Includes instruction in mathematics and logic, cognitive process modeling, dynamic systems, learning theories, brain and cognition, neural networking, programming, and applications to topics such as language acquisition, computer systems, and perception and behavior. A program that focuses on the application of biological, chemical, and physical principles to the study of converting raw agricultural products into processed forms suitable for direct human consumption, and the storage of such products. Includes instruction in applicable aspects of the agricultural sciences, human physiology and nutrition, food chemistry, agricultural products processing, food additives, food preparation and packaging, food storage and shipment, and related aspects of human health and safety including toxicology and pathology. A program that focuses on the application of scientific principles to the control of animal, insect and weed infestation of domesticated plant populations and other settings, including agricultural crops; the prevention/reduction of attendant economic loss; and the control of environmental pollution and degradation related to pest infestation and pest control measures. Includes instruction in entomology, applicable animal sciences, plant pathology and physiology, weed science, crop science, and environmental toxicology. A program that prepares individuals to serve as captains, executive officers, engineers and ranking mates on commercially licensed inland, coastal and ocean-going vessels. Includes instruction in maritime traditions and law, maritime policy, economics and management of commercial marine operations, basic naval architecture and engineering, shipboard power systems engineering, crew supervision, and administrative procedures. Command or supervise operations of ships and water vessels, such as tugboats and ferryboats. Required to hold license issued by U.S. Coast Guard. A general program that focuses on the development of textile products and their distribution and use in terms of the psychological, social, economic, and physical needs of consumers. Includes instruction in the production, distribution, marketing, and end use of various apparel and textile products. 97% of students graduated in the top half of their class. 76% of students graduated in the top quarter of their class. 40% of students graduated in the top tenth of their class. The average student pays $14,398 for tuition, fees, and other expenses, after grants and scholarships. Total stated tuition is $10,580, in-state and on-campus, before financial aid. Learn more about financial aid at http://www.udel.edu/finaid/. Estimate the net price for you at http://www.udel.edu/npc/. 62% of students graduated on time. 80% of students graduated in six years. 92% of full time students continued studying at this school after freshman year. The typical (median) early career salary of University of Delaware graduates is $50,300, according to Payscale. University of Delaware participates in the NCAA Division I-AA for college athletics. Want more info about University of Delaware? Get free advice from education experts and Noodle community members.